The Department of Sanitation (DSNY) snow removal designations were added to NYCityMap. Snow removal designations determine the snow plowing priority of each City street. The designations in priority order are: primary, secondary and tertiary. Private streets are not handle by DSNY but are shown on the map for completeness. The data is current for the 2011-2012 winter season. To access the application click here. From this search form on the Severe Weather site, the data will by default be turned on with the legend highlighted and scrolled to the top. To turn the layer directly from NYCityMap, search for a location click Show Additional Data on Map then click in the box next to the Snow Removal layer. The NYC Department of Health and Mental Hygiene Rat Information Portal was recently converted to Webmap. The Rat Information Portal (RIP) is a web-based mapping application where users can view rat inspection data. Findings from the Health Department’s inspections are searchable by address, or by borough, block and lot (BBL). You can use the map tools to find information about properties on the map. 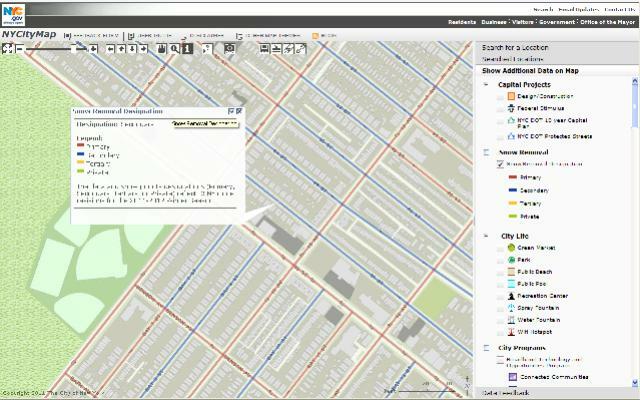 Visit the Rat Information Portal at gis.nyc.gov/doh/rip to view rat inspection data. Today we added two new requested layers to Citymap: Election and Municipal Court Districts. You can find them both under the Municipal Boundaries group with Show Additional Data on Map. New York City Board of Elections election districts for the City of New York. These district boundaries represent the redistricting as of the US Census 2000. The New York City Municipal Court boundaries.